Enter your details here and get an email with demo licenses and download links for PitchFunk sent to your email address. Science has officially gone too far. DMGAudio PitchFunk is an audio manipulating colossus that puts into your hands a laboratory-full of sound crunching effects. Don't let the crafted UI fool you, PitchFunk makes the filthiest noises you've never heard. Grab the demo. It's aliiive. A modulation-crazy curveball from DMG, PitchFunk is a veritable gift for sound designers and electronic producers. 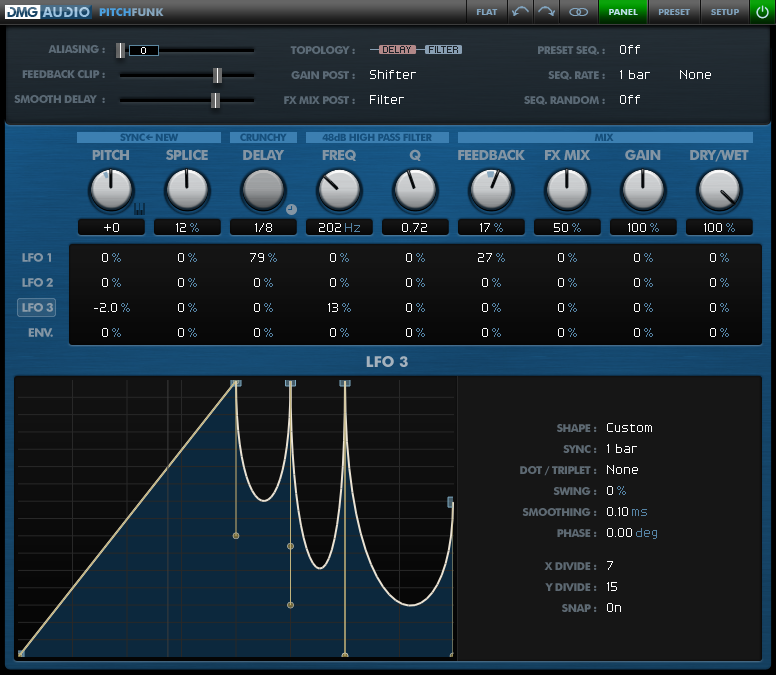 For intrepid sonic sculptors who love to noodle with filters and delays, PitchFunk is a must-have plug-in. The versatility of the modulation matrix and the bonkers results that can be achieved are successes in themselves, but beyond that, PitchFunk's complex web of signal interactions make it possible to create sounds you just couldn't get any other way. 10 pitch-shifting algorithms, based on classic hardware, optimised for modern CPUs, and extended for quality. 3 delay-line algorithms, covering vintage and modern delay lines. Configurable topology, for control over effect routing, to get exactly the right madness. Movable modulated gain-stage for pan/gain effects, to get things pumping and moving. Add Sync mode for tighter pitch shifting. C Random pattern starts from end of last sequence. This all started as a toy project - I was ill, so doing some research. I've always been interested in the history of pitch shifters and was researching into what it was that made the classic units so special. I built a little toy which sounded great. And then, because it seemed necessary, we added feedback. And things got a little more weird. So we added a delay, and it got weirder still. And then a filter, and then variable topologies, a massive modulation section, the moveable gainstage, MS and LR independent processing, and a host of other little things that will entertain and amuse. Suddenly the toy had grown into something monstrous. It was making sounds we couldn't describe any more. So we're doing the obvious, and offering it to the world. What's the worst that can happen?